**UPDATE**Jenn Newman has just announced that Marriage Equality New York (on Twitter @menyNYC) has joined as one of the sponsors for her evening at The Laurie Beechman Theater! MENY will have volunteers on hand to answer your questions about how you can get involved. Come. Listen to a fantastic night of music and learn how you can stand with Jenn and MENY to raise awareness for Marriage Equality! Ladies and Gents, it's a must! 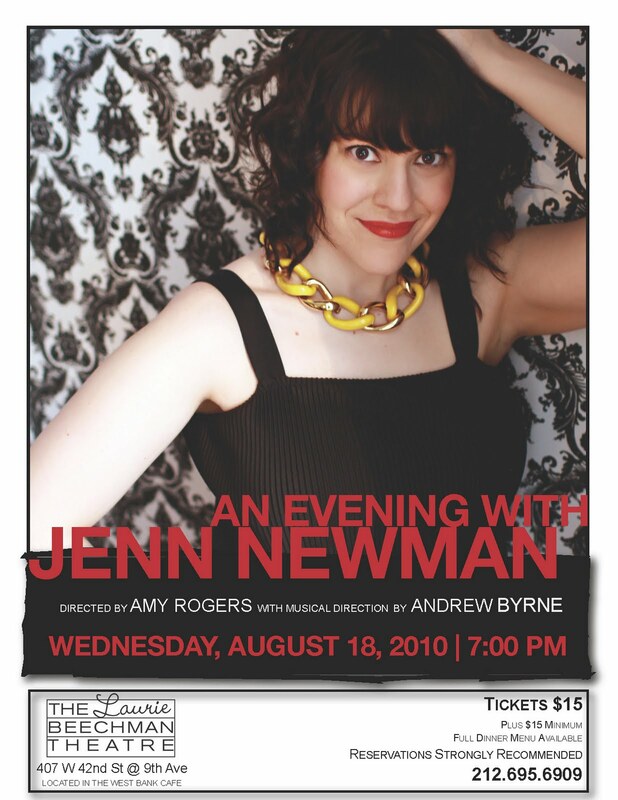 At August 18's concert, "An Evening with Jenn Newman", Jenn kicks off Team Newman which will help raise funds for MENY at MENY's NYC Wedding March. The word "cabaret" evokes many images — singers dressed to the nines, elegant nightclubs, intimate rooms, exorbitant cover charges and two-drink minimums. Brooklyn-based singer Jenn Newman (full disclosure: she is my better half) is helping to prove those images as true - with the exception of the exorbitant cover charges, of course. With a voice described as “warm, powerful, and with an ability to hit spectacular high notes,” Jenn is taking a break from the symphony pops stage to join a combo of musicians and make her cabaret debut at The Laurie Beechman Theatre. "An Evening with Jenn Newman", which is directed by Amy Rogers with music direction by Andrew Byrne, is going to be a spectacular night of standards, as well as new arrangements by Byrne. Take it from me, Friends... I've heard some of the songs you'll hear and when I say spectacular, I mean absolutely magnificent. Jenn is incorporating all of herself into this stunningly gorgeous, poignant, insightful, emotionally charged, funny and show-stopping night of cabaret. "An Evening with Jenn Newman"